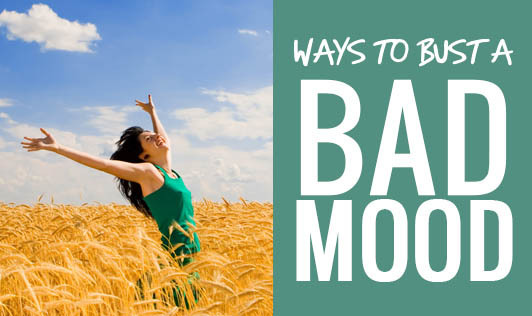 Ways to bust a bad mood! There are days when we feel like everything is going wrong and nothing can make it right. But there's no need to be glum a minute longer. • Listen to your favourite music. Research suggests that listening to your favourite music for 10 minutes can bust a bad mood and lower your blood pressure, heart rate and level of the stress hormone cortisol. • Touch your toes. It opens up your hip joints, which is where most individuals store tension. Hold the position for a minute and slowly roll up. As you lift, so will your mood. • Buy a bunch of fresh flowers. Studies have shown that being around foliage and colourful blooms relieves stress and increases calmness. • Connect with others. You may just want to lie on your sofa and watch television. But, talking to a loved one will lift your mood much better than watching TV. • Get some sunshine. Spending time outdoors can give you a jolt of awareness and energy. • Think of the good things. Spend a few minutes reflecting on your accomplishments over the past few years. Identifying and acknowledging your growth will provide an immediate sense of gratification and your mood will improve instantly.